New Delhi : Cardio vascular disease (CVD) is a major cause of death and disease in India, still very few studies are being conducted to map the changing trends in the disease burden or risk factors. 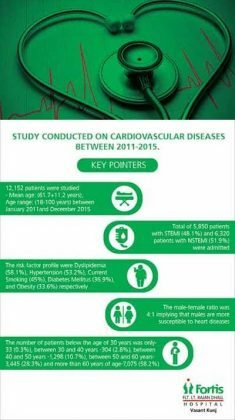 To address this serious gap, Fortis Healthcare conducted a study under the guidance of Dr. (Prof) Upendra Kaul, Executive Director, Cardiology, Fortis Flt. Lt. Rajan Dhall Hospital between 2011 and 2015 among 12152 patients. Key findings of the study are that the risk factor profile for Acute Coronary Syndrome (ACS) is similar to studies from the west. Dyslipidaemia or high lipid levels (58.1%) Hypertension (53.2%) and smoking (45%), emerged as the top three risk factors. There is no special tendency of younger populations to be affected with ACS. For this study conducted between January 2011 and December 2015, a total of 12,152 patients were studied the patient average age was 61.7+11.2 years, the age range between 18-100 years. This included 5,850 patients with heart attacks (ST elevation myocardial infarction or STEMI) and 6320 patients with heart muscle or related ailments (Non-ST elevation myocardial infarction or NSTEMI). The top risk factors were high cholesterol or Dyslipidemia (58.1%), Hypertension (53.2%), current smoking (45%), diabetes mellitus (36.9%), and obesity (33.6%) respectively. The male female ratio was 4:1 implying more males are susceptible to heart disease. The number of patients below the age of 30 years was only 33 (0.3%); between 30 and 40 years, 304 (2.8%); between 40 and 50 years, 1298 (10.7%); between 50 and 60 years, 3445 (28.3%) and more than 60 years of age, 7075 (58.2 %). This shows that heart disease does not show any special preference for younger age groups and continues to affect older populations. Cardio vascular diseases are disorders of the heart and blood vessels. They are a common cause of death, disability and lost man hours in India. Statistics from the WHO Ministry of Health and Family Welfare as well as Fortis Escorts Heart Institute state that non-communicable diseases in India account for more than 53% of deaths in India and out of these, CVDs have a major share of 24%. It is also first among top five causes of death among the Indian population. One-fifth of deaths in India are due to CVDs. By 2020, India will have the largest burden in the world with one-third of all deaths in India occurring due to CVDs. The growth of heart diseases is dependent on a number of interlinked factors such as ageing, changing lifestyles, unhealthy eating habits, tobacco use and rapidly evolving socio-economic determinants such as access to healthcare. High levels of bad cholesterol (elevated ApoB/ApoA1 ratio), diabetes mellitus, abdominal obesity and psycho-social stress are also linked to CVDs.